In the warehouse industry, you constantly deal with deliveries and pallets. They can easily start to accumulate if there is no system to organize them and keep them secure. Pallets on the floor can be a hazard and a hindrance to a smooth workplace, so it’s always best to find a place to store them securely. Pallet racking is here to help your business get organized. It’s the fastest and safest way to store multiple pallets on a single rack. 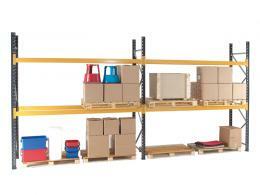 The pallet racking that Workplace Depot offers are strong and sturdy. We understand how heavy a pallet can be when fully loaded with goods. You need a place to keep them safe and secure, but you need to know that you aren’t setting them up for a fall. These racks are professionally mounted and installed so that you won’t ever misplace or lose a pallet due to flimsy racks. In fact, we are so confident in our racking that we offer warranties on the parts and labour after every sale. Browse through the options to see the variants we have on offer. These pallet racks don’t have to take up room in your warehouse. We have durable models that can be installed outdoors. They are secure and resistant to weather conditions. Your pallets can be safely stowed away, out of sight until you need them again. 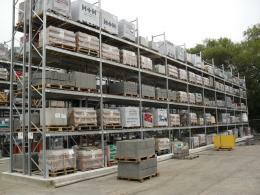 The racking is also modular so that you can store as many, or as few, pallets as your business can handle. 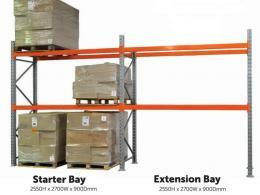 Workplace Deport offers the pallet racking at a better price than you’ll find anywhere else. In fact, our price match guarantee means no matter what you find elsewhere on the same product, we’ll ensure that we won’t be outsold. It's ready to install with all the clips and anchors, so get the pallet racking for your workplace today.